Today I’m thrilled to have Brian Johnson on the show. Brian is the founder of PPC Scope, a PPC measurement and optimization tool for Amazon Sellers. In addition, he runs a course called Sponsored Products Academy which teaches Amazon sellers the ins and outs of Amazon PPC ads. He was also one of the speakers at my conference as well. Brian is an expert on Amazon PPC and today we are going to delve deeply into how to optimize your campaigns. Brian’s process for launching an Amazon product. Outdated strategies that should be avoided today. What is AMS and how do you get access? What AMS ads allow you to do. Ignite.Sellerlabs.com – If you are selling on Amazon and running Amazon Sponsored Ads campaigns, then Ignite from Seller Labs is a must have tool. Click here and get a FREE 30 Day Trial. Steve: You are listening to the My Wife Quit her Job Podcast, the place where I bring on successful bootstrapped business owners and delve deeply into what strategies are working and what strategies are not with their businesses. Now today I’m thrilled to have Brian Johnson on the show, and we’re going to talk about strategies on how to improve your Amazon sponsored ad campaigns. This is a great episode, and I know you’ll learn a lot. But before we begin I want to give a quick shout out to Klaviyo who is a sponsor of the show. Now I’m always excited to talk about Klaviyo because they are the email marketing platform that I personally use for my ecommerce store, and I depend on Klaviyo for over 20% of my revenues. Now you’re probably wondering why Klaviyo and not another provider. Well, Klaviyo is the only email platform out there that is specifically built for ecommerce stores, and here’s why it’s so powerful. Klaviyo can track every single customer who has shopped in your store and exactly what they bought which allows you to do many things. So let’s say I want to send an email to everyone who purchased a red handkerchief in the last week, easy. Let’s say I want to set up a special autoresponder sequence to my customers depending on what they bought, piece of cake, and there is full revenue tracking on every single email. Klaviyo is the most powerful email platform that I’ve ever used and you could try them for free at mywifequitherjob.com/K-L-A-V-I-Y-O, once again that’s mywifequitherjob.com/K-L-A-V-I-Y-O. Now I also want to give a shout out to my other sponsor Seller Labs, and specifically I want to talk about their brand new tool Ignite which helps sellers manage their Amazon sponsored ads. Right now I’m using this tool to manage my Amazon sponsored ad campaigns, and it makes things a heck of a lot more convenient. So number one, I’ve always found it a major pain to generate my PPC reports on Amazon, cut and paste the data over to an excel spreadsheet and use pivot tables before I’m able do any analysis. Well Ignite pulls all that info for you automatically and allows you to easily see what keywords are working and what are not immediately, there is no need to manually create reports or play with excel. And second of all unless you’re a data geek, Amazon campaign data can be kind of hard to understand, and what is cool is that Ignite makes keyword and bidding recommendations on the fly that can be applied with a couple of clicks. So let’s say one of my keywords is bleeding money, well Ignite will alert me of that fact, and I can reduce that bid immediately. So bottom line Ignite makes managing your Amazon sponsored ads so much easier, and the fact that they provide me with alerts means that I no longer have to monitor my campaigns like a hawk. If there are keywords that are doing well, Ignite tells me to add them to my exact match campaigns. If my keywords are losing money, well Ignite tells me to either remove the keyword or to reduce the bid. So head on over to Sellerlabs.com/steve where you’ll find awesome tutorials on how to run Amazon PPC ads and the opportunity to try Ignite for 30 days for free. So once again that’s Sellerlabs.com/steve. Now on the show. Steve: Welcome to the My Wife Quit Her Job Podcast. Today I’m thrilled to have Brian Johnson on the show. Now Brian is the founder of PPC Scope, a PPC measurement and optimization tool for Amazon sellers. In addition he runs a course called Sponsored Products Academy, which teaches Amazon sellers the ins and outs of Amazon PPC ads. He’s actually also going to be one of the speakers at my conference in Fort Lauderdale Florida in about four weeks, and he’s an expert on Amazon PPC, and today we’re going to delve deeply into how to optimize your campaigns. And with that welcome to the show Brian, how are you doing today man? Brian: I’m doing fantastic, thanks for having me here. Steve: Yeah, so Brian, what is your background with selling online, how did you kind of get into physical products, and how did that kind of gravitate your career towards teaching PPC? Brian: Absolutely, so I actually started out on the eBay platform many years ago. I was in – I was selling physical products. I was actually selling like banking equipment, coin sorters, money counters, that type of thing to governments, to the FBI, to movie CDOs all over the place. It was kind of fascinating but it was a lot of work, because my margins were like 15% because of the way that I was doing it, primarily drop shipping through eBay. But I did that for about seven years. Brian: And at some point I started switching over, and I actually got pulled in during – was it Amazing Seller machine two, or ASM 2 by a friend of mine who was going through and sign on Amazon. And so that was probably what, three years ago now, and time flies. And so I jumped over and started selling on Amazon and realized, okay knowing – because I had tried Amazon before and I just didn’t know all those steps, I didn’t know how to game the system if you will. I had to ask for reviews out, you know what the weaknesses were. I made a lot of assumptions as far as the similarities between Amazon and eBay, and I found out that eBay does a lot more work for the seller than Amazon does, at least originally did. And so I did and once I started selling and started sourcing for products on Amazon, I realized, okay I get much better margins, and I’ve got a whole new environment I can play in, let me switch over to AMS — to Amazon, excuse me. And I left eBay behind. Steve: Did you start by drop shipping on Amazon at first like similar to eBay or no? Brian: I was yes, so similar to eBay I started out with the products that I already knew, and one of the things I found was it was a different animal, because I was typically dealing with higher price point products, those that were $1500, $4,000, that type of thing. Brian: And I found on both platforms that fraud was still an issue. The same kind of fraud issues that I would have on eBay, the same kind of problems on Amazon. Brian: It just wasn’t converting as well, because you couldn’t get all the reviews and the social proof, and so you just couldn’t get the conversion. So I immediately realized that, okay I need to kind of conform to what the popular teaching is right now, and that is the whole small item, with no moving parts, and something that you’d easily source and re-label and that’s how I started out. I actually started out in – what was it, in kitchen. I think my first product was a Julian vegetable peeler which I still use like a demo or a training product today. Brian: Yeah, I think like most people is that they are opportunity buys. They are primarily ones that – initially I started looking at ones like a lot of people do, you look at the ones that are, like hey this would be cool to sell and everything. I realized you know what, there is a lot less competition, there’s a lot more money in the stuff that is absolutely unsexy. Kind of my jokes example of that is yoga mats. Brian: Very probable, you could sell them all day long, but you don’t want to tell anybody. Steve: That goes along the same line as handkerchiefs. For the longest time I didn’t want to tell anyone that because it’s a feminine product, but anyways. Steve: So how did that evolve to PPC? Brian: So I started selling and I had friends of mine who were also their own business owners, they weren’t on necessarily on Amazon, but they were friends of people who were trying to sell on Amazon and were struggling. So they said, hey can you start helping them, can you give them some advice? And I had learned just enough to be dangerous, and so I started helping them. Quickly that took over, so I was actually consulting and managing their entire account of over 800 products selling on Amazon. Brian: What evolved from that, I started adding like second, third, fourth company or different company while I was consulting. Suddenly I was consulting for brand management, dealing with FBA, dealing with support, dealing with the customers, everything. And one of the things that I kept on struggling with was the advertising. Like there’s got to be a better way that I can do this, and nobody was teaching anything that makes any sense when it comes to the advertising. So out of survival I learned how to do sponsored products, and I spent way too many hours. It’s something that I usually say on – Tommy [ph] was, don’t do what I did, because I spent way too many hours and way too much money testing all this stuff and I still do to this day. But two and a half years later of doing, finally I actually just came into only working on sponsored products and AMS. You get a certain amount of expertise when you finally, you do it every single day. Steve: Yeah absolutely. Did you have any prior like Google AdWords experience for example? Brian: I did yeah. So I had used Google AdWords, I used other ad platforms before, and so I certainly respect that those are much more powerful, much more flexible platforms than what sponsored product or AMS offers. But at the same time Amazon has got to start somewhere just like Wal-Mart and Jet will eventually start somewhere. Steve: Sure absolutely. I guess let’s start this interview since you sell your own products, like if you were to launch a brand new Amazon product today, you know incentivized reviews are gone, what would be your process and how would sponsored ads kind of fall into that mix? Brian: So I generally teach the – in 2017 I’ll tell people that you got to really understand who your target audience is. A lot of times we come in as sellers and we make opportunity buys based off of some analysis we do. It’s not necessarily a product we’re passionate about, nor do we know who the specific sellers are, or rather the [inaudible 00:10:05], I guess that would be true too, the other sellers as well as who the buyers are, and so you’re just kind of jumping in blind. We can use sponsored products because that’s the only platform that Amazon has given us as feedback as far as what the customers are using, or those shoppers and terminology is, so that we can learn what it is that they are looking for, what they’re searching for, so that we can understand them better and what flavors they’re looking for, how they’re using the language as far as how to find a product and to convert to a product. And we can continue to horn in and target that specific audience that’s working well for this specific product variation. And so a lot of times if we can first learn who our audience is, we can do a much more effective job with a much better ROI in targeting that audience, both through the product listing content as well as any kind of external promotions we might do in order to boost an initial product launch. And certainly through our advertising, we can put a lot more money into very targeted phrases that have a lot more impact in moving units, in getting profitable with our advertising. Steve: So walk me through this process of kind of getting to know and understand your target customer. Brian: Okay so in sponsored products, because sponsored products is the one that gives you that customer search term list. Brian: I’ll set up a series of campaigns starting out with automatic, an automatic discovery campaign, which is basically going through, and just kind of testing the market, allowing Amazon to show the ad to audience relevant. They may not necessarily have product relevant search terms, but they’ll certainly show it to relevant audiences. They may be looking for products similar to the product that we’re selling. Steve: Okay, how granular do you put these campaigns, let’s say you had ten products and they are kind of despaired items, would you create ten different campaigns at that point? Brian: No, I’d actually create – I mean so if there are two total or if there are ten different audiences with the expectation that the search term analogy and the keywords are going to be different, those would justify a different campaign, because that’s a different target audience. If they are simply variations, the same product group, they’re all variations targeting the same audience, likely to have the same search terms and keywords, or a high overlap, then I’ll put those into the same target audience campaign. But then I’ll separate each product into their own ad group or ad group set. So single ad group in an automatic campaign because that’s all you can do because it’s just a broad match. And that’s kind of give me better analytics and optimization control that allows me to really identify, okay this search term performed best for this specific product variation, that kind of segmentation. It also allows me to do have a very fine grind control of optimization, my negative keyword matching as an example with automatic campaign. I can do that at the product level because a search term that may seem relevant to both may perform very well for one product, may perform very poorly for a different product. I want to be able to drop the one that’s performing poorly for that specific search term, but then I want to amplify where it’s working well for the other product. And so that kind of segmentation is necessary in order to accomplish that. Steve: So you start with these automatic campaigns, like how much data do you gather before you start making any decisions? Brian: I usually within two days. So I typically set up my manual research campaign at the same time. I’m not waiting around for data any more. I used to, just like go through and do really high bid and then switch to a low bid and then wait a couple of weeks. That was all fine ideally, but this year we have to move a lot faster because there is way too much competition to just kind if sit on it for too long. So with the automatic discovery campaign, essentially what we’re just trying to do is allow Amazon to run with a fairly low bid, sometimes that’s 30 cents, 50 cents, so lower than you would expect for that target audience and for that product line. The manual campaign is a research campaign. This is where we’re going to be testing, we’re going to be researching a ton of related keyword phrases to the product that I’m selling, and I’m going to dump those into what I call the ad group set. So the same similar structure in that you might have one campaign that covers ten similar product variations, but then I segment further so that each product has three ad groups, one for each match type. Steve: Yeah there is no money those orders actually, yeah they are different ones. Steve: Okay so for the automated campaigns, so you said you start driving data from that within a couple of days, does that imply that you’re just picking the keywords that you think are going to convert for your product from that automated campaign list, and then creating manual broad match campaigns in the beginning? Brian: Well so let’s say in the manual campaign it’s going to be in all three match types, phrase by far at a minimum I will do phrase match, but that’s kind of a longer discussion there. But what I’m doing is essentially I’m not waiting around for my automatic campaign to tell me what to do. I’m simply just turning it on to allow Amazon to show my ad to audience relevant as well as competitor search terms. So they do a pretty good job as far as that goes, but I’m going to go out there and do my own keyword research, be aggressive about and not wait around for an automatic campaign. I’m going to set up my manual campaign with my three ad group structure for each product. I’m going to go out; I’m going to research hundreds if not thousands. I might start out and just create a presence – actually I create a cheat sheet for this whole thing. But initially well I’ll start out with my initial keyword research. It’s simply just using Amazon’s own internal suggested keywords when you create an ad group for its product variation. That’s the minimum, but that’s only going to give you like 10, 20 keywords maybe. And then I’ll move on to using basic keyword research, so I’ll go and use something like keyword.io or a Samurai tool or Merchant Words. And I will go out and find several hundred, a couple of a hundred to several hundred keywords that are directly related to the keywords that I think are most likely to be the big, my number one keyword or number one keywords for my product, and I’ll add those into my manual research campaign in each ad group, in each match type. I’m not concerned about duplication of keywords. That allows me to test all these keywords, it basically gives Amazon – I’m telling Amazon here’s all these options for you to show my ad across multiple match types, across multiple products. And then I’ll take a step further in my keyword research and I’ll go out and I’ll really reverse engineer my competition using more advanced tools such as like say Keyword Inspector for instance, and some of these tools that I can pull in a lot more keywords. And I’ve got some pretty specialized research methods that I use for the things like Keyword Inspector. Steve: I want to take a moment to thank ReferralCandy for being a sponsor of the show. Now in this day and age, word of mouth is a huge driver of business for most ecommerce stores, and the best way to amplify word of mouth marketing is through a referral program, and this is where ReferralCandy shines. With just a couple of clicks of the mouse, you can add a referral program to your ecommerce store and reward your customers for telling their friends about your shop. And this tactic works wonders, and in fact it is not uncommon to get a ridiculous return on investment. So for example, Greats Footwear who is a ReferralCandy customer is currently seeing a 20X ROI, and referral word of mouth marketing is also useful for building up your social media presence as well, because everyone is talking about your company with their friends on Facebook and Twitter. And the best part is that ReferralCandy is a set it and forget it service, requires no technical set up and they are giving My wife Quit Her Job listeners 50 bucks to try them out if you go to promo.referralcandy.com/Steve. Once again it’s promo.referralcandy.com/Steve to get a $50 credit to try out the service risk free. Now back to the show. So your automatic campaigns, you’re not really using them in the beginning, right? You just kind of let them run in the background? Brian: Yeah pretty much because what I’ll do is I might run it, I may start it out, I’ll kick it off just kind of arbitrary and entirely understand the product, the competitive average cost per click of the product that I am in. If I’m launching a brand new product that I haven’t been before, I might start it out at 75 cents, I might start it out higher just to kind of get an idea, okay what are some of the popular search terms going for from a cost per click stand point. But ultimately probably within two to four weeks, I’ve already dropped down my automatic campaign to half of that, like maybe 30 cents, may 50 cents, something very lower than what I’m definitely spending in my manual research campaign as an example. And at the same time if the automatic campaign does pick up any converting search terms, I’m going to pull those over to my manual campaign and test them across all products in each match type anyway. So I’m essentially constantly just gutting the automatic campaign. Brian: But I want to run it in the back ground because the automatic campaign does a decent job of showing your ad for again audience relevant and competitive brand names. Steve: Okay, and in terms of launching a brand new product, you start running these right away? Brian: Yeah, in fact a lot of times what I will do is I’ll set up a shell campaign even before I have the product stocked. So as soon as I create the product listing and I’m waiting around, I can do all kinds of keyword research in advance. I don’t need to wait until my product is live. Steve: So you are doing this is via an automated – are you running ads actually before your- actually that can’t happen, right? Brian: You are not running ads before you have a product live, but you can do a keyword research on your competitors as an example. Steve: I see you are just prepping yourself for the campaign before your product is in stock? Brian: Because it might take me a few days in order to collect all the data that I need because I might be collecting thousands of keywords in my keyword research. Brian: And I don’t want to wait until after my product is live because I’m losing a precious amount of time during that initial honeymoon phase where you are trying to get that sale velocity going for a brand new product. Steve: Okay, and in terms of your target ACOS — actually let’s talk about the matrix that you use for a spread. I assume you use a cost and conversion rate. In the beginning when you’re first launching a product, are you trying to — are you devoting a much larger percentage of your product kind of like a giveaway? Brian: So in other words I’m overspending on my ad. Brian: So as an initial advertising objective, and that’s something I indefinitely teach is to identify what your advertising objective is, because that’s going to dictate how you are spending your money, how you are doing your weekly activities on optimization, or competitor targeting or something like that. Initially I am overspending; I am basically just flooding Amazon with a ton of keywords. They are only going to show — I might give them, even if I gave then 50,000 keywords, they might only show ads for 50 of those keywords per products as an example, because they have a very limited attention span if you will. But the problem is I don’t know which 50 until I give them everything. So that’s part of the reason why we do all this, and it seems like it’s really wasteful, but at the same time we don’t have many options that allow us to really focus in on — like only show the keywords that we think have the highest potential, because the data simply isn’t offered, not by third party tools, not by even Amazon itself as far as only pick these 50 and only run these 50. Unfortunately he had to shotgun it so. Steve: Interesting, so there is no way for you to know which keywords Amazon actually is going to use. Are there things you can do to kind of better influence Amazon to use those keywords, so to speak? Brian: Well, I wouldn’t say that there is absolutely no way. There are ways, but the problem is that the advanced tools that are necessary in order to do the analytics regarding relevance have not been fully developed yet. We have some in — we have prototype tools right now within our software team, but we haven’t made those public yet. Brian: So there is basically, there is ways that you can test for relevancy; there is also ways you can test if you have an AMS account. For instance you can test to see what Amazon’s own internal expected volume rage is, otherwise any kind of third party tools is going to be a rough estimate as far as tra — anybody who comes from the AdWords background is always reliant on the search volume. We always kind of live and die by that search volume number and unfortunately Amazon doesn’t divulge that information to anybody, to any third party tool and so a lot of those are primarily estimates. Steve: There’s probably a pretty good correlation though between like Google searches, right and Amazon searches? Brian: You would think, yeah, I mean one of them is informational search engine that was an ecommerce search engine. However if you can narrow it down, I wish that the Google keyword planer tool allowed you to focus just on Google shopping as an option, because that would give us a more, a stronger, a closer correlation to what it might work on Amazon. Steve: So your objective in the beginning is to flood everything. So when do you start turning back the dial, like do you do that based on like the number of reviews that you’ve gathered so far. Like kind of, like how does it transition down? Brian: Yeah, so initially my first advertising objective might be simply just to get sales velocity. In other words pushing as many units as possible that’s going to contribute all be it a small amount to the number of units that are being sold overall for the product in hopes that that’s going to help bump up my organic search position. Obviously the sponsored products may only contribute 15 to 20% units, total units sold to that volume and so it’s not going to have, it’s not like you can turn on sponsored products and just suddenly be on page one. Brian: It simply doesn’t work that way. However it can make a small contribution and it may be enough to carry you up to page two, maybe even page one if you have weak competition, to hopefully allow you to stick your landing if you will, to get up into that high position. Same kind of thing, I would probably also supplement that with some kind of a launch service. If I can do giveaways without the review incentive of course, then I would now probably combine that in order to try to get the biggest push initially. Now once I see that I’m starting to hold a higher position, then I’ll switch my advertising objective to more of an audience research. That’s primarily where I’m still willing to overspend, just not to an extreme that I might during a launch. Brian: And at that point what I’m doing is I’m collecting as many search term data as I can about the shoppers for this product, how they are finding me, especially what the clicks through rates are for the products, for the campaigns, for the keywords or the search terms rather. And then ultimately carrying that over to what the conversion rate is or the conversion is for each of those search terms. So I can start identifying a set of search terms that convert the best for each product variation, for each skew. Steve: You mentioned click through rate, what is like a good click through rate in your eyes? Brian: So at the campaign level usually I’m looking to try to get in the, at a minimum above like say like 0.3% click through rate. Brian: Ideally what I’m expecting typically is over 4.4% at the keyword level, at the campaign level. I started dropping down below 0.2% and I’m losing my audience relevance. I’ve got to disconnect with my audience. Steve: So that’s interesting that you look at those two metrics, so you don’t look at ACOS or? Brian: Only the ACOS, not necessary just because I use tools that obviously with PPC Scope we calculate profitability and profitability is more accurate than ACOS. Brian: Ultimately if you know which most sellers unfortunately don’t know, please find this out is what your net profit margin percentages is for each product. What is your break-even number, what is your break-even percentage before advertising? That can equate to what your break-even ACOS is. So you technically could use the ACOS number, the advertising cost, or sale percentage as a guideline as far as whether or not your advertising is profitable. But ultimately I also like to calculate the full profitability so that I know how profitable each keyword is let alone each product reach campaign. Steve: Okay, so what’s interesting here is the click through — let’s say you had a keyword that had like a pretty low click through rate like below your guidelines, but the conversion rate was excellent. Has that ever happened to you? Brian: No, I mean that does happen because there are some product niches that have — where shoppers tend to gravitate toward one or two very generic keywords. Like a one word keyword, maybe a two word keyword and unfortunately it has such broad appeal across a lot of different products, but it’s used, it’s kind of like — it’s used by the popular group, by the masses. It’s not as long tale; it’s not as descriptive as some other products have. And so sometimes you don’t have a choice but to simply compete with other sellers on these really high competitive search terms. And I can tell you is that especially products that — here is where that click through rate really tanks for most people and conversion rate, is anytime you have a product that you are selling that has either a lot of competition, has a lot of style, flavor, color, size, variations, clothing is an example, cell phone cases, anything that has a lot of different style variations reduces the chance of a shopper to make a decision quickly. Brian: And so they tend to — they get into this window shopping mode, and they browse around, they are just shopping surfing around for different styles that seem to jump out at them that they like. The problem is that your click through rate, and your conversion rate usually get pretty poor as a result of selling in that type of product. Steve: So at that point you probably would cut down on those keywords and use more specific ones that specify the color in the search? Brian: If you can, if you can segment. That’s one of the reason why we segment into separate ad groups, so we can try to identify these five search terms as an example seem to gravitate toward this one product variation. That way we can emphasize for that product variation rather than try to force it for all the product variations. So that’s when we start looking at — and certainly taking each I’ll certainly go in and look at the ones that are converting, and I’ll do additional keyword research in order to see if I can find a handful of other related, directly relevant keywords to that one that is converting but maybe has other poor metrics to it, and see if I can find some alternatives that I can supplement or even replace that. Steve: Okay, but often times there is one advertised search volume right, of course, the specific ones. Brian: No, no, true, true. But cumulatively, cumulatively they may. Steve: Okay, so okay so, let me just kind of summarize what you said. So you run all out, and you flood the market at first, but then once you start getting some traction, meaning like you are moving up in the organic search ranks, you start dialing it down. Do you always, at the lowest point of your campaign, are you just trying to break even or are you trying to be profitable with your campaigns? Brian: Well, and so that’s I mean that’s another advertising objective. Do you want to move the most units you can while still in break even while not overspending on your ads, or do you want to go for profit? Those will be two different advertising objectives and both of those are totally fine. Steve: Okay, I was just asking from your own personal products like how you do it. Are you just trying to break even, or do you try and make a profit on the product that you personally sell? Brian: Well, so my first goal with my advertising, I usually try to do breakeven so I can move the most number of units. But I’m also primarily using the advertising in order to really understand who my target audience is so that I can optimize my product listings for the highest organic search position in specific keyword product niches that has less competition, less resistance, yet still converts, still has been proven to convert through my PPC advertising. So really I’m leveraging the data that I have invested in my PPC in order to benefit my organic sales. My organic sales are typically going to be four of five times the number that I’m going to sell through my advertising. So my focus really is on the organic, where results can I use the PPC data in order to improve my organic listing. Brian: And that’s mostly just about understanding the audience very well. Steve: Okay, Okay. So in that case from what it kind of sounds like is since organic is such a large percentage of the sales, it kind of makes sense to keep your advertising spend on the higher side to kind of boost your organic, the organic sales. Is that kind of true? Brian: Exactly yeah, that makes sense. I mean some people will still continue to overspend on specific keywords, because they need that in order to hold a position because maybe they have a product listing that is organically positioned between competitor five and competitor seven. And if they slip at all, if they sell one less unit per day, then they are going to slip down to position eight which of course they wouldn’t want. Brian: And so you kind of have to pick your battle. Steve: Sure, no that makes sense. Brian: As far as — there are some keywords that you usually kind of continue to overspend because you have a need in order to maintain a certain level from an organic standpoint, and the slight bump that the PPC is going to give you may make all the difference in the world in some product niches. Steve: Okay, okay, let’s switch gears a little bit and talk about AMS sponsored ads. So first of all if you wouldn’t mind defining to the listeners what that is, how do you get access and what do these AMS Ads allow you to do. Brian: Okay, so AMS ads are — typically you’re going to find these in three different areas. They are going to be the bottomed sponsored ads, the bottom search results, they are going to be the top banner ad that goes along the very top above all organic search results, above all sponsored ads, just below, some of them just below the search bar, you’ve got a wide banner ad that goes across top, and that’s an AMS headline search. And then on not only your own product listings, but also your competitor product listings you’ll typically see an ad that runs below the add to cart button on the right hand side. These are all AMS ads that are part of the Amazon marketing services which is a second Amazon marketing platform, their PPC platform that supplements sponsored products. The way that you get that is through — currently for most marketplaces you have to get ungated through vendor express. There are like Japan for instance they’ve already made it so that you can go directly. You can avoid Vendor Express and get directly to AMS. There are plans for AMS to become more accessible to more sellers. However right now you have to go through and get approved through Vendor Express in order to get ungated to the Amazon Marketing Services ads. Steve: I just want to take a moment to tell you about a free resource that I offer on my website that you may not be aware of. If you’re interested in starting your own online store, I put together a comprehensive six day mini course on how to get started in ecommerce that you should all check out. It contains both video and text based tutorials that go over the entire process of finding products to sell all the way to getting your first sales online. Now this course is free and can be obtained at mywifequitherjob.com/free. Just sign up right there on the front page via email, and I’ll send you the course right away. Once again that’s mywifequitherjob.com/free, now back to the show. So here is the misconception that I had hoped you can clear up. So you don’t — just because you sign up for Vendor Express doesn’t really mean that you need to sell the Amazon at volume, right? Brian: No, in fact one of the things that we teach is to essentially put in like a sacrificial product. This could be one of your own products, simply is just a dead product and you don’t care about as much. It could be one that you source specifically for ungating into Vendor Express, it’s more of a case of you get, you submit a product that you effectively want Amazon to take control over the whole listing. Meaning you lose over that listing, and you are selling wholesale to Amazon, they are selling the product but really all it takes in order to get ugated to AMS is to have an initial product approved, and you fulfill the sample order that they have and sometimes that’s a dozen, sometimes that’s 30 units, and they’ll give you access to the AMS platform which ultimately is what we want. You don’t have to continue to sell to Amazon after that initial sample order is fulfilled because you’ve already been ungated. Steve: Right, okay. So let’s talk about some of these ads. So let’s talk about the headline search ads first. First of all how do you search for these ads, and then how do they kind of perform compared to some of the other regular sponsored ads that you have access to? Brian: Sure so typically AMS ads are going to have lower volumes simply because they tend to be more targeted, more segmented. So the way that we set up the campaigns for headline search within AMS is typically a lower bid. This is — for instance if our sponsored product keywords have an average cost per click of a dollar for instance, we might be spending 20, 30 cents on our bidding on the headline search ad within AMS. We sometimes do, we do a lot more variety and a lot more volume as far as number of campaigns that we run, because it’s giving us more flexibility on how we structure these ads. It’s not simply just showing our product and a limited portion of a title like sponsored products does, we actually have a little more control as far as how these are presented. The images that are being used, the title that’s being used, and so we have more controls as far as being able to copyright some of the compelling messages that are being shown in these AMS ads. Steve: Can you give me an example of like a headline ad that’s worked for you really well, and how you kind of write the copy differently than what the default is for regular sponsored product ad? Brian: Sure so, typically for our sponsored products the titles are usually, we are trying to lead with our target keyword phrase that were trying to get organically ranked for. That’s unnecessary from an AMS standpoint, because an AMS headline search ad or a banner ad, we can target a specific keyword, maybe that’s our highest volume keyword. It could be a single keyword. AMS will even tell us if it’s a high, medium, or low search volume keyword. So it gives us some benefits there that we don’t normally have. Steve: But developing the banner ad it’s like AdWords at that point. You get to write the copy, right? Brian: Correct, yeah, so what you can do is on a banner ad, typically you have to put three products. You have to identify three of your products that are going to be shown as part of this banner ad. So you got the ability to modify a short title. It’s like 50 characters and so you can wordsmith that 50 characters to try to be a bit more compelling. In other words you are not just simply just saying blue widget, you are saying, this is the most popular blue widget. You can’t necessarily lie and make a claim that’s not real of course. Brian: Yeah, exactly, yeah, yeah, thank you. A bit more sensational title in that 50 characters than you are going to get away within a product listing title for instance. Steve: Right, okay. And so given that, when you think that the quick through rate will be higher for these since it’s like right smack at the top, right? Brian: It is, yeah the click through is higher and in fact it has a higher requirement also. So for a keyword to continue to run in sponsored products it has to maintain at least a 0.07% click through rate over like let’s say a four week period of time, extended period of time. Brian: So it’s 0.07%. In AMS it has to be 0.7%. So it’s a lot more, it requires a lot higher click through rate otherwise Amazon will automatically, or AMS will automatically shut off that keyword and say, this one is not getting a high enough click through rate for us to keep showing. Brian: So you do have to do some clean up periodically as far as that goes in your little place keywords maybe that that are not performing as well. You can also adjust keywords, there is some individual tools within the AMS ads that allow you to control how likely your ad is going to be showing up, you can adjust the bid. Sometimes some individual keywords, they may have a high volume, but then you are going to have a higher competition, the cost can like skyrocket pretty quickly under the right conditions. Steve: So the AMS ad it sounds like is two, over two times the click through rate of where you would consider a good click through rate on a regular sponsored ad, it sounds like, right? Brian: Yeah, you can say that yeah. Steve: Okay, okay. So can we talk a little bit about the conversion rate of these, I mean since the click through rate is a lot higher, chances are you are even getting more traffic, like higher volumes of traffic, right? Steve: And so how does — is the conversion rate just as good as the regular sponsored product ad in your experience or is it worse? Brian: I think it’s actually, yeah, I mean I would say it’s probably — actually there is actually similarity. Typically what affects the conversion rate is once you bring — because what you are essentially showing in the banner ad, in the headline ad is you are showing, here is three different products with some short titles and some small images. And people are clicking through thinking they are going to see a variety of products and you may show three on there and you come in to a brand page with this product page, and you are not going into a specific product detail like you would for sponsored ads. You are going into essentially a brand page that has multiple products. Brian: Now AMS also gives us some additional options in order to be able to present more polished form added brand pages, and to how to use different templates that allows us to make a much better presentation similar to what we might see with enhanced brand content for instance or a plus content where you have much more formatted and like larger images or specific text that you can use on a brand page that is going to very heavily, as far as like how does that appeal to a shopper, does that increase conversion rate? Steve: So it takes some two clicks to get to a product essentially, minimum right? Brian: Because you are basically going to a search result page or a brand landing page, and then you can go into a specific product. That is correct. Steve: Okay. So that in itself would probably reduce the conversion a little bit I would imagine, right? Brian: You would think, yeah, but your cost of going in, your cost of running the ad is so low in comparison to sponsored products. A lot of times your ROI is much better. You’re ACOS is very low. Steve: Okay, okay. So this sounds like an essential tool to go on your PPC arsenal when you say like the volumes are higher, higher visibility, okay. Brian: Yeah, a common question that we get is why can’t I just AMS exclusively? And I would say don’t do that, because you need to continue to use the sponsored products in order to continue to understand who your audience is and the search terminology they are using because AMS is not going to tell you the search terminology. Brian: So don’t go blind to your audience simply by going to — committing to just AMS, use them in conjunction with each other. Steve: What about the product display ads, like the ones that are underneath the add to cart, how do those perform for you? Brian: Product display ads do not perform nearly as much. They take a lot more work. Similarly you can do a certain amount of formatting. You can target individual competitive products or audience classes during categories, and so you’ve got different options as far as how you target your ad, how you place your ad. The challenge that you usually have is if your ad is showing up below the add to cart on somebody’s product detail page, then you are essentially competing. A shopper is already on that product detail page, so for whatever reason they’ve been convinced so far of this product, and they see your ad as kind of a distracting alternative, and unless you have a compelling offer, a more compelling than the product detail they are on, it’s not going to be as effective. It’s not going to either get click or is not going to convert. And so it does require a lot more work from a standpoint of set up as far individual targeting, it requires a lot more set up than say sponsored products does. Brian: But if you do it and you test a lot of different ad titles and you test a lot of different targeting methods, then it can evolve into a very effective method of advertising, but keep in mind is the more work you are willing to put into it the less competition you will have. Steve: Okay, now that makes sense, but in terms of low hanging fruit, regular sponsored products ads plus the headline search are the primary drivers, right, for you? Brian: Yes, I would say. Brian: Yeah, definitely. Now one of the things that for your audience is that a common method is that I have to have three products in order to run the headline search. You have to have three product listings, but one of the things that I might do on that is I’ll have one product that is — because once I get past Vendor Express, I can advertise all my products and still qualify for AMS. I don’t have to do just the one that I submitted to Vendor Express. Steve: It’s like a loop hole. Brian: It’s a walk around. Brian: But don’t stop yourself saying, I have to wait until I have three products otherwise I can’t do this, no, no. Steve: When you are launching a product, do you go full blown headline search ads also in addition to these sponsored products, what we were talking about earlier? Brian: Anything but I can get more realistic when I first launch to get more brand recognition, and the more number of times that I can get in front of an audience, because I’d rather have three ad placements, an organic listing, a sponsored ad, maybe even two sponsored ads, both in line sponsored ads as well as the light rail sponsored ads, because I can get both of those as well as the headline search. So potentially I could have four placements or four points of visibility on page one for my target keywords if I line up all those — if I have all those running. And that’s four times the chances that somebody else who just has their organic position or just has an ad running, I have four times the chances that a shopper is going to click on my ad as opposed to somebody else’s. Steve: Right. Cool. Well Brian we’ve chatting for almost 45 minutes, I want to be respectful of your time. I’m going to be seeing you pretty soon at the Sellers Summit, but where can people get a hold of you or check out some of the product offering that you have? Brian: Okay, so certainly my flagship training is sponsoredproductsacademy.com, the PPC analysis software, that’s the one we’ve had for two years now. It’s certainly come a long way and that is PPCscope.com. Brian: And then I’ve got my Amazon PPC trouble shooting community on Facebook. Steve: Okay, why don’t you send me that link for that, and then I’ll go ahead and put that in show notes. Is your Sponsored Products Academy open all year round, or do you close and open it? Brian: We close and open it. Yeah, I think it’s closed currently. Brian: Because we just had a launch recently so, yeah I need to be able to focus on the individual students. Steve: Right, right, okay. So I’ll put a link. I mean I imagine there is a waiting list, right? Steve: For the course yeah. Steve: Okay, cool. So I’ll link all that stuff up in the show notes. Brian, thanks a lot for coming to the show, really appreciate your time. Brian: Absolutely Steve, thanks for having me. Steve: Hope you enjoyed that episode. 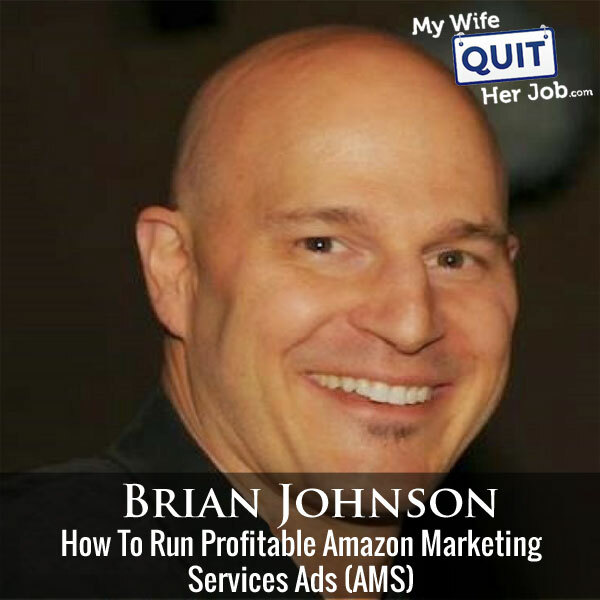 Brian Johnson is one of the best guys in the industry when it comes to running profitable Amazon sponsored ad campaigns, and he also has a course. So go check it out when you get a chance. For more information about this episode, go to mywifequitherjob.com/episode171. And once again I want to thank SellerLabs.com. Their tool Ignite is what I use to manage my Amazon PPC campaigns. Instead of the old tedious way of generating reports, and analyzing your ad campaigns in Excel, Ignite aggregates all that info for you in one place, and allows you to quickly visualize your data to make decision fast. So not only does it save time, but it also makes managing your Amazon campaigns so much easier. So head on over to Sellerlabs.com/Steve and sign up for a free 30 day trial. Once again that’s SellerLabs.com/Steve. I also want to thank Klaviyo which is my email marketing platform of choice for ecommerce merchants. You can easily put together automated flows like an abandoned cart sequence, a post purchase flow, a win back campaign, basically all these sequences that will make you money on auto pilot. So head on over to MyWifeQuitHerJob.com/K-L-A-V-I-Y-O, once again that’s MyWifeQuitHerJob.com/K-L-A-V-I-Y-O. Now I talk about how I use all these tools on my blog, and if you are interested in starting your own ecommerce store head on over to MyWifeQuitHerJob.com and sign up for my free six day mini course. Just type in your email and I’ll send you the course right away. Thanks for listening.